Therapy programs that purport to “convert” lesbian, gay, bisexual, and transgender kids have caused immeasurable harm since they became prominent in the 1970s. Rigorous studies have shown again and again that efforts to change young people’s sexual orientation not only fail, but are also linked to suicidal behavior, depression, anxiety, drug use and risky sexual behavior. The Youth Mental Health Protection Act, sponsored by state Rep. Kelly Cassidy in the House (House Bill 217) and by state Sen. Daniel Biss in the Senate (Senate Bill 111), was introduced in the Illinois General Assembly early in 2015, and Equality Illinois announced its intention to make passage of the bill a priority during the legislative session. 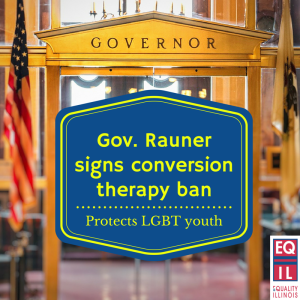 “Illinois should be at the forefront of banning this failed and discredited non-therapy that attempts to change the unchangeable, our innate sexual orientation and gender identity,” said Bernard Cherkasov, CEO of Equality Illinois. The House passed the legislation on May 19, 2015, and the Senate approved it on May 29, 2015. Equality Illinois held discussions with Gov. 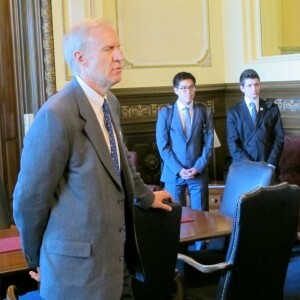 Bruce Rauner and his staff about the importance of these protections and introduced the governor to two conversion therapy survivors to share their stories with him. Gov. Rauner signed the bill into law on August 20, 2015. Bans on conversion therapy have now been enacted into law in Illinois, California, New Jersey, Oregon, and Washington, D.C. with bipartisan support. In March 2015, Illinois mental health experts released a letter saying efforts to force LGBT youth to change are harmful and ineffective and urged state action to stop it. Read their letter here. “Sexual orientation and gender identity are not mental disorders or diseases, and, therefore, ethical mental health practitioners should not attempt to ‘cure’ or ‘repair’ LGBT people through the use of sexual orientation change efforts,” the experts said. In short, there is clear evidence that conversion therapy does not work, and some significant evidence that it is also harmful to LGBT people. Equality Illinois is hopeful that other states will follow suit.